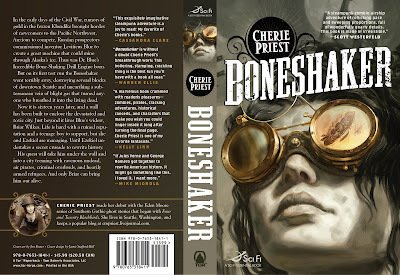 In a recent fundraiser/auction sponsored by Cherie Priest I had an opportunity to bid on an ARC of the steampunk novel Boneshaker. Guess what arrived this week? I know what I'll be doing this weekend :) Remember to check out www.theclockworkcentury.com for more information. I'll be getting my review up as soon as possible. Ooooh lucky! :) I can't wait to read this one. Looking forward to hearing your thoughts. Darn, I thought it'd be an ARC giveaway! Enjoy! I look forward to your thoughts also. This one's on my list to buy! I just posted my review for Boneshaker today! It was...well, I'll let you read the review, if you want to, without saying more here. :) Can't wait to see what you think of it! Sounds excellent, waiting for your thoughts! It's on my list as well. Anna next week - I promise! Donna I would to if I wasn't lucky enough to have snagged this copy. Michelle I already like Cherie's writing so I'm betting I am going to be very pleased. Oh Amy you can dream :) but honestly I wish I did have an extra. That would really heat up the blog. Chelle I saw you posted it today. I'm going to wait until I've read and put my thoughts to paper before I drop by and check out your review. I haven't read anything by Cherie yet, so I'll be waiting for your review. I've heard good things though, so I am looking forward to getting my own copy at some point. Jackie I'd planned to read it on the weekend but RL got in the way. I love Cherie's writing and am pumped about what she can do with steampunk.